A decedent pasta always makes a week night meal seem special. Make that said decedent pasta a little healthier and you can enjoy it every single night of the week if you truly wanted! And that is exactly what I did with these stuffed shells, they went through a healthy makeover! I loaded the cheesy filling with good for you veggies, tossed in some sun-dried tomatoes for a flavor punch, lightened up the cheese and voila a delicious main course! Serve these lovely stuffed shells with a simple green salad and you have a complete meal! Oh, and don't forgot the toasty bread with olive oil! What I love most about this recipe and well stuffed shells in general is that they are pretty much fool proof! You can sub in almost any vegetable and are way easier then making lasagna, at least in my opinion! I am not hating on lasagna, I love a good lasagna, but I find that my lasagna always turns out soupy. 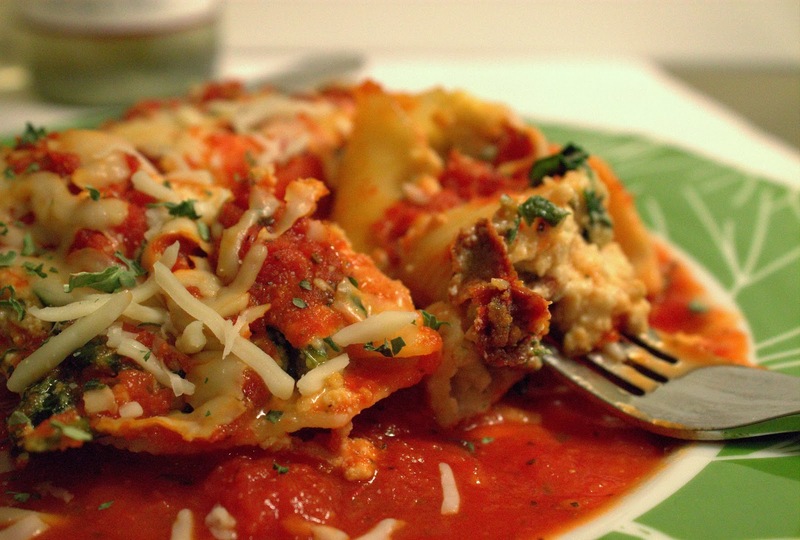 With stuffed shells there is no soupiness and you still get that delicious lasagna flavor you are craving! Make these for someone special or make them just because, either way you won't be sorry! •Preheat oven to 350 degrees. • Cook shells according to package direction and set aside. • In a large skillet heat olive oil, add onion, red pepper and shallot and cook until tender. Next add in your garlic, cook 2 minutes. Add chopped spinach to your skillet a handful at a time. Cook vegetable mixture until spinach is wilted, set aside. •In a large bowl combine ricotta cheese, and egg whites, stir until combined. Add 1 cup of of mozzarella cheese, basil and pepper to your ricotta cheese and egg mixture. Stir until mozzarella and ricotta cheese are well incorporated. •To finish the shell filling add your vegetables to your ricotta cheese mixture and stir until vegetables are covered with the cheese mixture. •Pour 1 cup sauce in the bottom of a 9x13 inch baking dish and evenly distribute. •Stuff each shell with cheese mixture and set in pan open side up. Spread remaining sauce over shells and top with remaining 1/2 cup of mozzarella cheese. •Bake in a 350 degree oven for 40 minutes. Cheese should be melted and bubbly when shells are done.